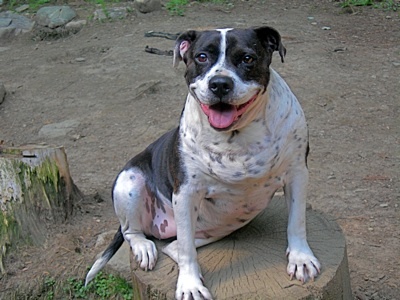 Daisie Lou is my American Bulldog Mix. She was the third member of my family and her story is quite an interesting one. She was a victim of dog fighting and was used for bait, which is when a non aggressive dog is placed in a fight with an aggressive fighting dog, usually so the fighting dog gets the taste of blood. In her case, she was only 3 months old and her mouth was taped closed with duct tape so she would not be able to fight back. Amazingly, she was not killed, but instead she was found wandering the streets of South Central (Los Angeles), hungry, scared and in severely bad shape. When I found her, I immediately took her to one of my vets I work closely with. I have a number of different vets who I bring my rescue dogs and cats to for care. They all are very compassionate and extremely helpful for me when it comes to billing me for the work they perform. Most will not even charge anything for their time; just lab work, some medications, etc. I knew Daisie Lou had a very slim chance of surviving, if any at all. When I arrived to the vet, he rushed her in for observation. After examining her, he informed me that she had the following: a collar that had been placed on her neck when she was a small puppy that was not removed or loosened, so skin from her neck had started to grow literally “into” the collar itself; she had pneumonia; she had 3 types of worms; she had demodectic mange; her bones were making sores on her body where she was way underweight; dehydrated; and simply in shock. The vet did everything he could do and said it was up to Daisie Lou to do the rest. I thought it would be best if I took her home with me, because she had already been through so much and I wanted her to feel the feeling of a “safe” home. He agreed and told me to call him at his house at anytime if I thought she needed to come back in case her condition became worse. That was enough for me. I wrapped her in a blanket and off we went to my place. Both Emme and Jasper (my two dogs) knew Daisie Lou was very sick, so they did not try to play “territorial or alpha dog” with her. If I could only tell them Daisie Lou was only a “visitor” and I was only fostering her until she became well enough to place for adoption. They left her alone except for the occasional sniffing. For 3 days and 2 nights, I stayed up pretty much around the clock with her. We had to rush in the middle of the night, twice, to see the vet. Both times were close calls where she had severe labored breathing, but managed to pull through. I remember those frantic drives as I tried to remain calm and positive. I would chant “nam myo renge kyo” (a Buddhist chant) the entire drive. I had empty kleenex boxes all over the place where I had to wipe her nose constantly. She had such a hard time breathing from having the pneumonia. She was taking the highest strength of medications she could (considering her very young age). I even put a dab of Vick’s vapor rub on a kleenex and place it near/under her nose so it would help her breathe easier, which seemed to help for a little while. In about two months, she made a complete recovery. Her coat had grown (no more mange), her appetite had increased dramatically (no more skin and bones) and all other ailments had diminished. She became strong enough to run and play with the other dogs, including her new friends at the dog parks. I mentioned my plans was to foster Daisie Lou, but somewhere along the way I became attached to her. Maybe it was the nights of lying next to her and making sure she was breathing, or maybe when I prepared her food in a blender and fed it to her using a syringe, or maybe it was a combination of many things. Nonetheless, I thought , “Two dogs was easy enough…..what is three”. So, now Daisie Lou’s next visit to the vet was getting a microchip with my name and address as her permanent one. To see how healthy and happy Daisie Lou is today, one would never imagine what terrible treatment she received before she came under your care. A heartwarming story and an example of what good results can come from perseverance combined with love. This broke my heart. I almost could not rad it. So sad for her. Thank you for saving her and giving her that home she so desperately needed. I know, dealing with it was very heartbreaking. Words cannot express in detail how sick she was. It was a combination of many things that healed her. I was willing to do anything I could and I did. She has not had any health problems since and looking at her today, you would never imagine she had such a rough start to life.